These flowers are a fun and colorful way to celebrate the spring holiday. Beat butter and cream cheese in a large mixing bowl on medium to high speed for 30 seconds. Add powdered sugar, baking powder, and salt. Beat until combined, scraping sides of bowl occassionally. Beat in egg and extract(s) until combined. Cover and chill dough for about an hour. Dough should be easy to handle. Shape dough into 1/4 inch balls. Roll balls in colored sugar. 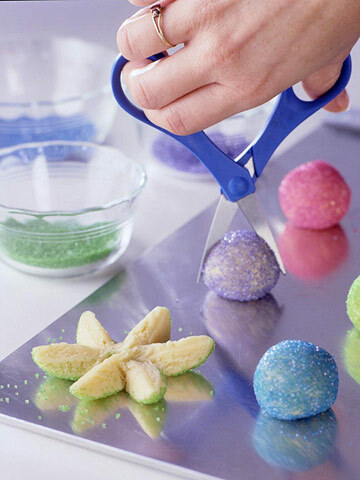 Use scissors to snip balls in half (3/4 of the way through). Snip each half into thirds, making a total of 6 wedges. Sprinkle additional colored sugar in the center of each. Bake for 8-9 minutes, or until edges are browned. Remove from oven and immediately place candy piece in the center of each cookie. Transfer to wire racks for cooling. Makes about 2 dozen. They can be stored in an airtight container (use wax paper to separate layers) for about a week at room temperature, or in the freezer for up to 3 months.